Due to high demand, the 36M is currently on Pre-Order. We will begin shipping these on May 13th. If you need equipment before this date for an event, please reach out to us at ssmith@cobrafiringsystems.com or 518-222-7410. 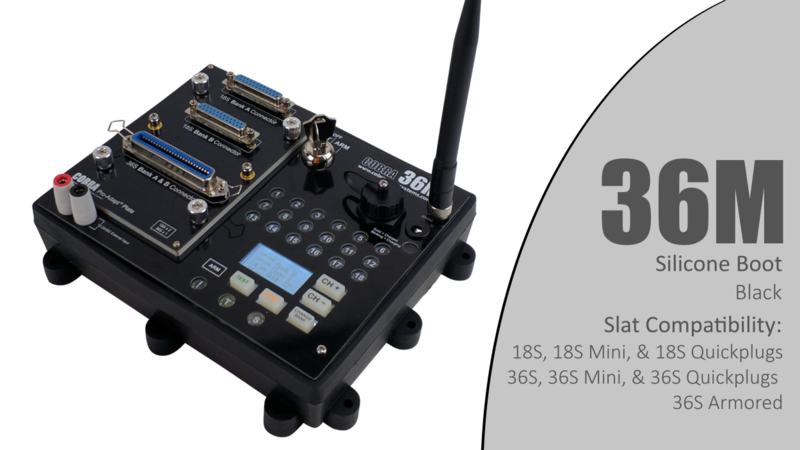 The COBRA 36M is a compact and rugged 36-cue firing module that functions universally with the 18R and 18R2 hand-held remotes. 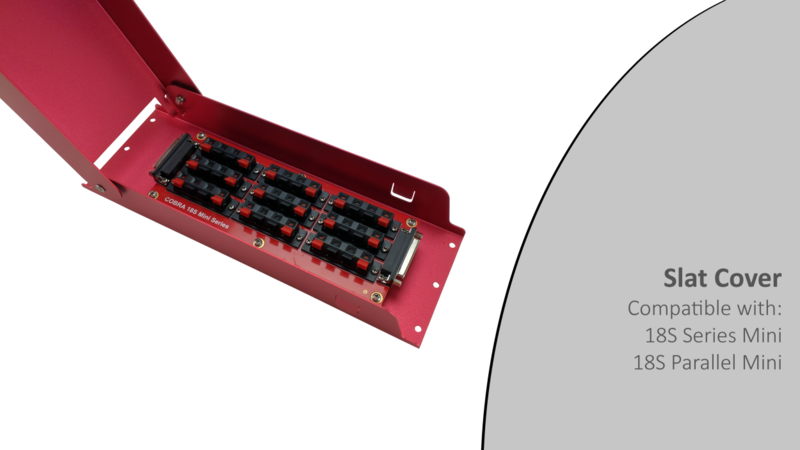 Each firing module has two independent banks (A & B) that can be set to one of 100 unique channels by simply pressing the + and - buttons on the module. For example, bank A can be set to channel 1 and bank B can be set to channel 2. 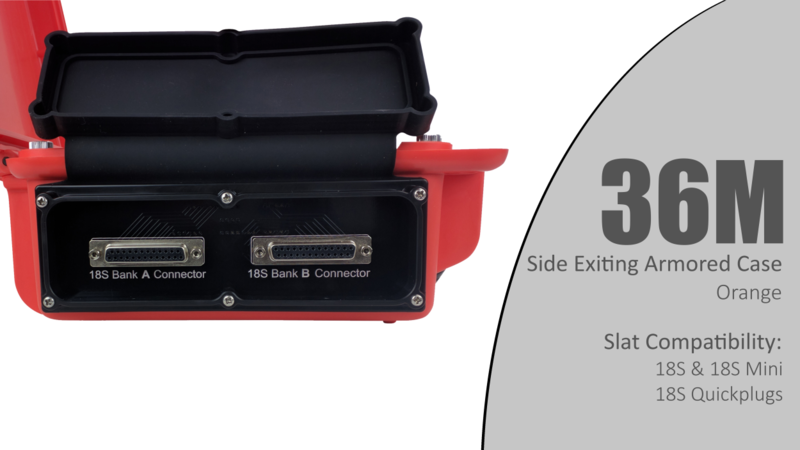 Each bank connects to the included 18S Slat, or 18S Mini Slat using an onboard DB25 connector for each individual bank. Using the 18R or 18R2 hand-held remote channel controls, you can fire any banks on the same channel. You can fire unlimited modules at the exact same time by setting them to the same channel. The 36M also boasts a backlit LCD screen, standard built-in rechargeable LiPo battery, support for replaceable 9V batteries, and support for 12-24V external power. Using Pro-Adapt Plate technology, the 36M offers a truly connection agnostic design. The 36M simply plugs securely into the 2 x 18S and 1 x 36S Pro-Adapt Plate. The same 36M can be used with any of the COBRA Pro-Adapt Plates. 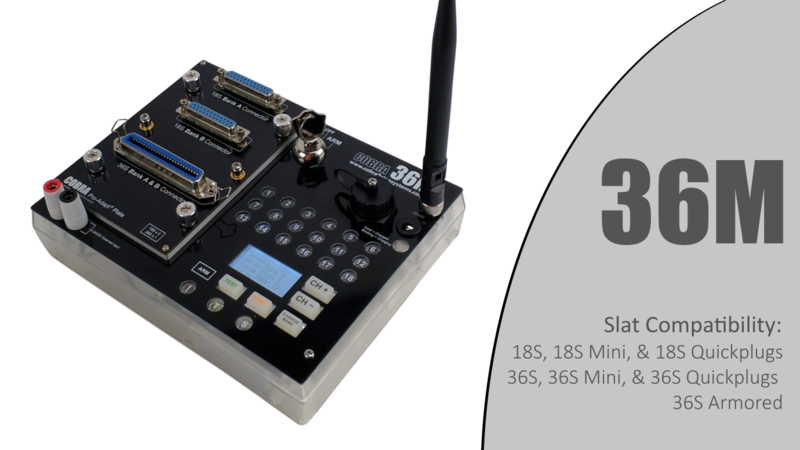 This version comes with two 1M (3 ft.) DB25 Heavy Duty Slat Cables, and two of your choice of series or parallel 18S Mini Slats. For more information on slats, please watch our Slats video. The 36M comes with two banks (A & B) that can be channeled independently of each other. Simply press CH+ or CH- on the 36M to set a bank to a channel between 00 and 99. Press the 'Change Bank' button to toggle between banks and use the CH+ or CH- change the channel for the selected bank. Banks can be set to any channel in any order. For example Bank A can be set to channel 2 and bank B can be set to channel 3. Then, by changing the channel on the 18R or 18R2 hand-held remote, you can fire any bank set to the same channel. The 36M comes standard with a rechargable 14.8v, 900mAh battery. It can also support the use of three 9V (PP3) batteries. 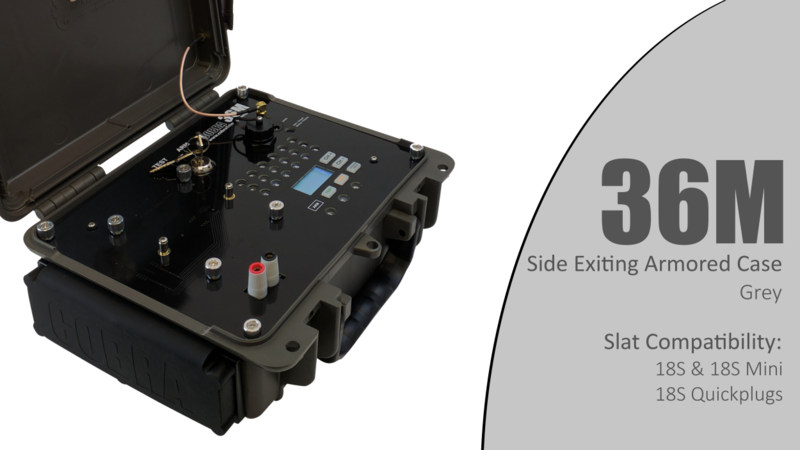 One of the 9V batteries is used exclusively to power the system operations, while the other two are used for firing cues. The 36M also has a power conserving sleep mode. When powering off the 18R or 18R2 remote, the 36M will automatically fall asleep and conserve power for up to 30 hours. 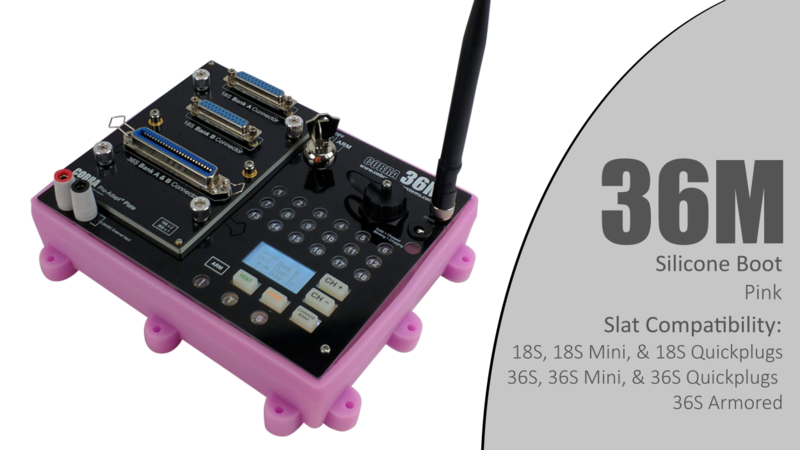 This allows you to place and arm your modules into position hours before the show begins. Then, when turning on your 18R or 18R2 remote, the module wakes up and is ready to fire. At COBRA, we believe safety and reliability are the most important features of any firing system. With that in mind, every COBRA system incorporates the below collection of technological and usability based features. This ensures safe and reliable functionality every time you use the system. IEEE® Unique Network MAC Addresses - Every COBRA remote contains a fully unique network MAC address. This address is programmed onto the unit at the time of production and contains 16 x 0-F base-16 values. For example, 00.1C.2C.00.00.C0.00.01. By syncing a firing module to a remote, the remote's network MAC address is saved and remembered on the firing module, even after power-on and power-off. Once saved, the firing module will ONLY respond to the remote containing this unique MAC address. This prevents any other remotes from firing your system. In addition, any time a firing module is synced to a different remote, the previous MAC address is overwritten, thereby ensuring the firing module only responds to the last remote to which it was synced. 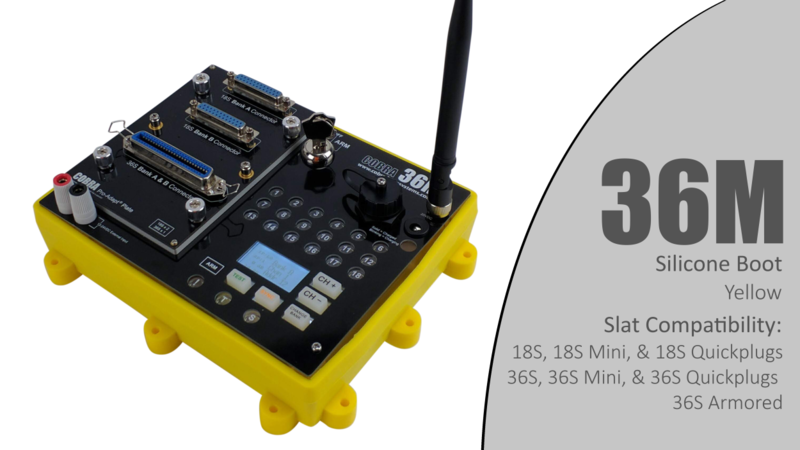 2.4GHz tranceiver modules - The COBRA 36M uses a 2.4GHz transceiver module manufactured by Synapse, a US company that both develops and manufactures its SNAP line of IEEE 802.15.4 radio modules and transceiver ICs. The same transceiver and software development platform is used successfully not only by COBRA, but also in a variety of safety-critical industrial wireless applications, including medical monitoring systems and airport lighting controls. 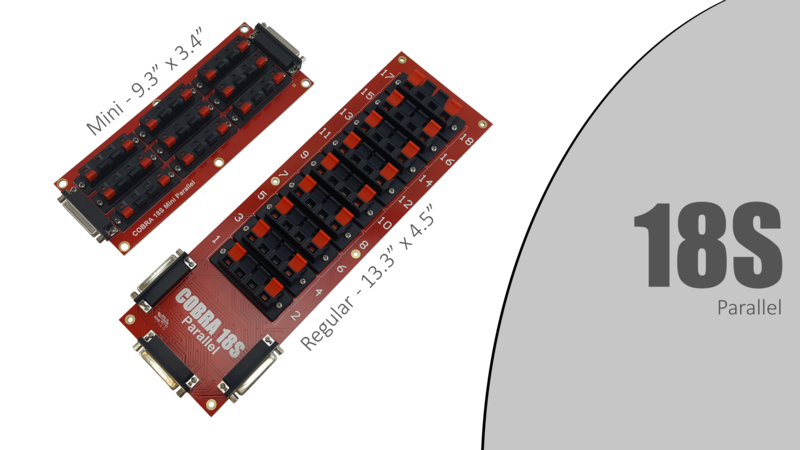 Redundant, solid-state, self-testing MOSFETs - The COBRA 36M uses redundant solid-state firing FETs on both the high and low side of each firing cue. This ensures that no power is supplied to the cue unless the firing module is both armed, in fire mode and is actively firing a cue. The redundant FETs provide protection against unintentional electro-static discharge (ESD) and serve to automatically test for damaged or shorted FETs upon system start-up. If detected, the system will automatically disable itself and will not operate. NFPA compliant user-design - The COBRA system adheres to National Fire Protection Association (NFPA) chapter 9.2 requirements including a key-operated switch, multiple actions to arm and fire, and minimum current requirements when performing continuity tests. Contains FCC, CE and IC certified RF Module - The 36M contains the Synpase 802.15.4 2.4GHz RF transceiver module. The 36M is enclosed in 2.5mm thick high-strength ABS plastic and shielded by a highly thermal and impact resistant black armored plating on the top side. 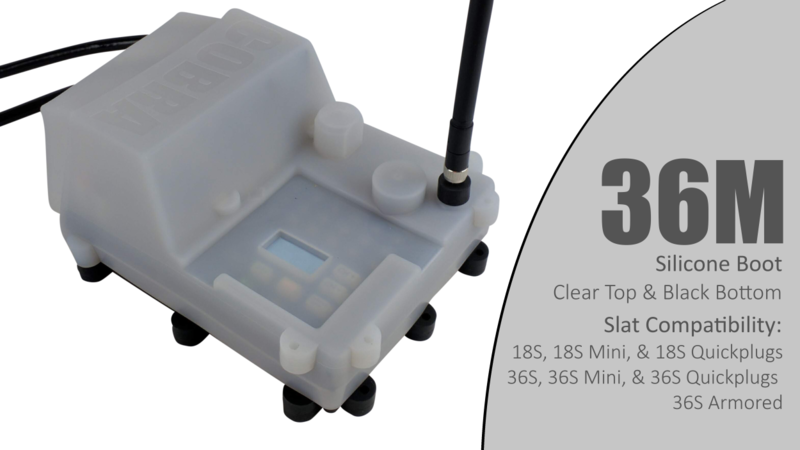 The clear design minimizes all entry of air, moisture, and dust into the electronic housing by eliminating the need for cut-outs and micro-gaps in the enclosure. Polyurethane-coated fire-retardant silicon keypads have custom walls that push up against the top-enclosure to protect against moisture and dust. External 12-24V DC Input - Rugged external binding posts support external 12 and 24V DC input. For permanent installations, we offer a custom 110/220V A/C to 24V D/C converter. Use the internal LiPo battery pack together with the A/C input to act as a real-time power backup. Increased Amperage - Replaceable 9V batteries produce a peak current of 3 Amps. Using the LiPo battery pack, this increases to 6 Amps. Using the external power input, we can produce up to 9 Amps of peak current. This will support firing up to 8 and 12 e-match / talons respectively, in addition to also supporting the firing of high current devices such as confetti cannons, flame projectors, and cryo jets. Cold Weather Performance - Fire extreme cold shows with confidence with improved cold weather performance down to -20F / -29C. Dual Protection Circuits for LiPo Safety - COBRA incorporates dual overcharge, undercharge, and over voltage protection circuits. The first protection circuit is built into the 36M motherboard. The second protection circuit is built into the battery itself. This means if one of the protection circuits fails, the other acts as a backup. While we don't expect any failures, feel confident that we have designed both the battery and charge circuitry with the highest level of safety and protection in mind. 3 x 9V 8 hrs. 20 hrs. 14.8V LiPo 18 hrs. 36 hrs. 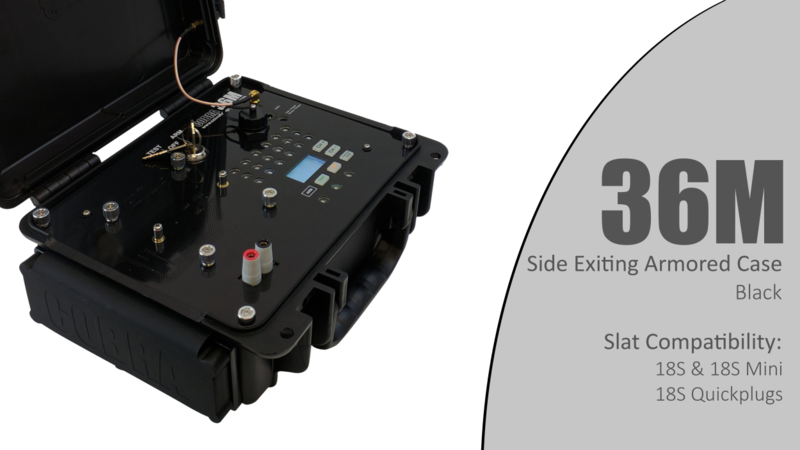 The 36M has three different power options including 9V replaceable batteries, an internal 14.8V rechargeable LiPo battery pack, and the option for external 12-24V power input. You can view the maximum amount of e-match or talons you can fire based on your specific configuration below. Please find a listing of potential error codes displayed on the 36M during the boot-up process. For each code, we have provided the cause, and steps to resolve. Cause #1: The 36M battery levels are too low. Charge the 36M battery to remove this error message. If using 9V batteries, check the battery orientation to confirm it's not reversed. Also confirm the voltage mode is set to 9.0 explained below. Cause #2: The 36M is set to the incorrect Voltage Mode. Press and hold the 'Test' Button. While holding down 'Test', press the 'CH+' or 'CH-' at the same time to toggle the mode. Re-start the 36M. The error code should no longer display. Cause: The 36M has detected a faulty cue. Contact us if you see this error message. Cause: A button is pressed while the module was powering on. Make sure that no buttons are being pressed or may be stuck during the boot-up process. Then, re-start the 36M. Cause: The firmware of the 36M does not match the firmware of the remote that it has been synced to. The 36M firmware must match the 18R or 18R2 firmware to which it's synced. When powering on the 18R, 18R2 or 36M, the firmware is the first piece of information displayed. For example, 5.0.2. It is critical that the 18R or 18R2 has the same firmware version as the 36M. See Firmware Updates for more information / instruction on how to reprogram your units. Cause: The 36M was not completely upgraded properly. The 36M has two different firmware files. The first is a .spy file that is loaded to the transceiver using the Synpase Portal software. The second is a 90M.s19 file loaded to the processor using the USB drive on the device. When first loading the .spy file using Portal, this error code will always display. This is normal. Please proceed to the next step and load the 90M.s19 file per the instructions. Once this file is loaded, the error code should disappear after re-starting. For more information, please see Firmware Updates on how to reprogram your units. You can also email us at ssmith@cobrafiringsystems.com for further assistance. Cause: The 36M has detected an issue with the transceiver, which likely needs to be replaced. Please contact us if you see this error message. Please find a listing of Frequently Asked Questions (FAQ) for the 36M. What is a bank and how does the 36M function with the 18R and 18R2? To remain compatible with the 18R and 18R2, the 36M has been divided up into two sets of 18 cues. These sets are referred to as Bank A and Bank B. There is a CHANGE BANK button on the 36M. You can press this button to toggle between banks A and B. For each bank, you can press and hold the CH+ or CH- buttons to change the bank for that channel. For example, you can set bank A to channel 01, and bank B to channel 02. Banks can be set to any channel, and also the same channel to fire at the same time in parallel. 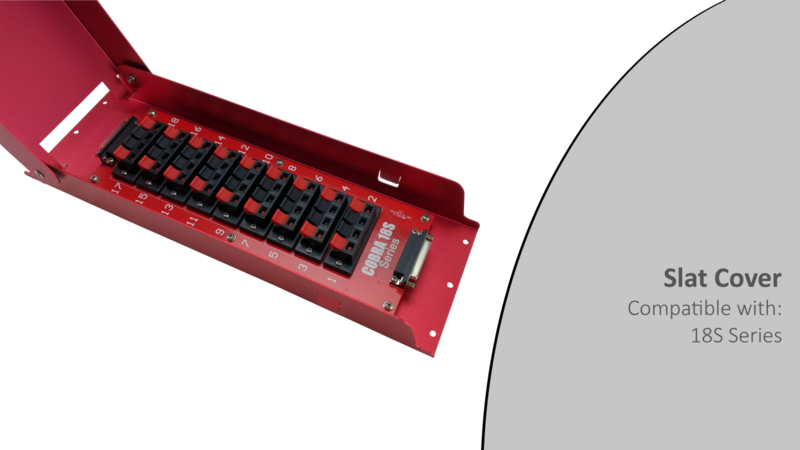 For testing continuity on the module, press the TEST button for the 1-18 cue LEDs to display green for the selected bank. For firing cues, you can simply fire cues for a selected channel. It is suggested to write the channel on a small piece of masking tape next to the bank on the module or slat to notify the operator which bank is set to which channel. What is a Pro-Adapt Plate? 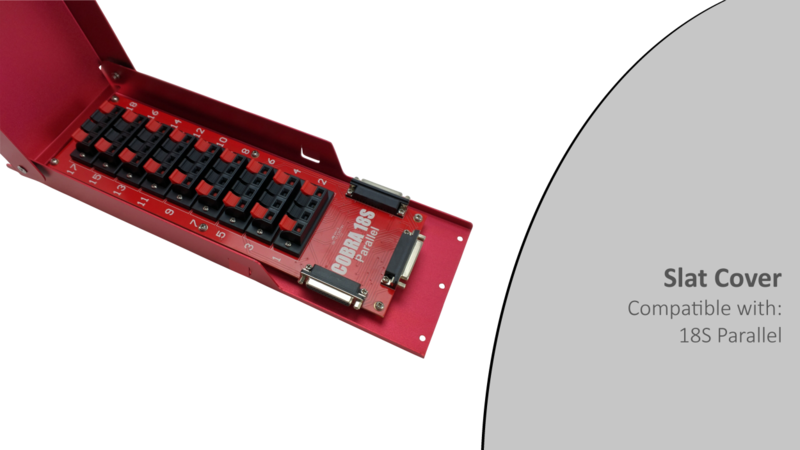 A Pro-Adapt Plate is a connector plate that is mounted on the 36M that allows for varying types of cue connection methods. Currently COBRA offers two 36M Pro-Adapt Plates. These include a large armored case with on-board cues, and a plate that supports both two 18S slats, and soon to come 36S slat. In the future, COBRA will offer a wide variety of connection methods. What type of battery options / battery life is supported? 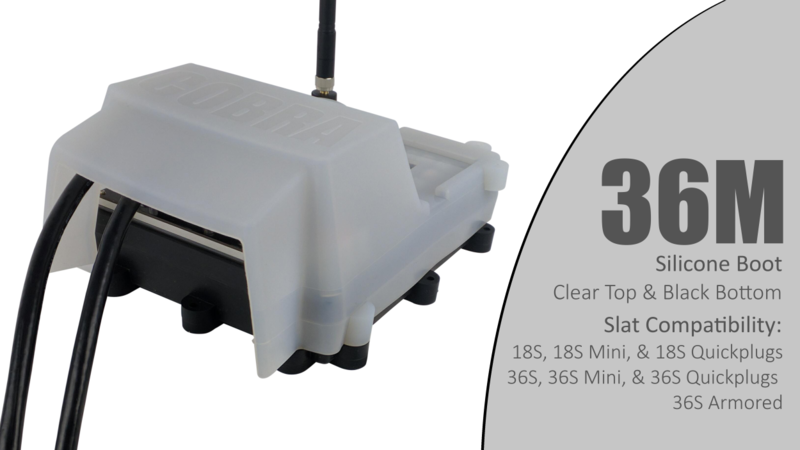 The 36M is offered standard with our rechargeable 14.8V LiPo Battery. The 36M also supports the use of replaceable 9V batteries for backup in addition to 12-24V external power. The following lists the available power options and associated battery life in both active and sleep mode operation. 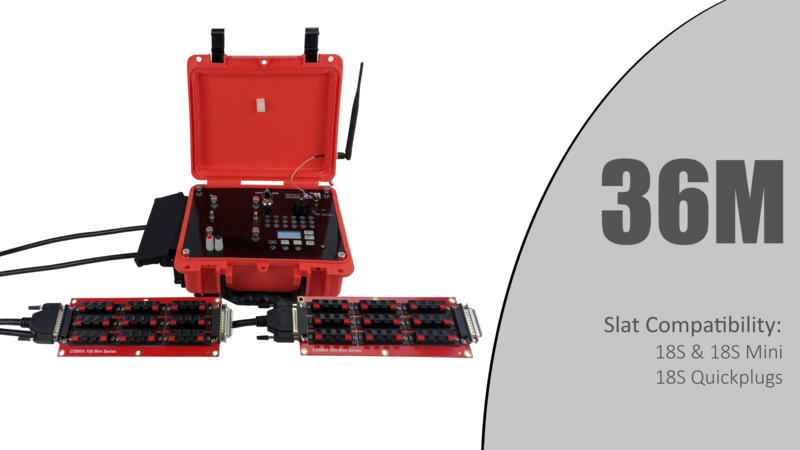 How many e-match / Talons can the 36M fire when wiring in series or parallel? This is dependent on the type of battery you are using. Please find the below chart for the maximum number of e-matches and Talons you can fire. Please note that Talons cannot be wired in series. What type of charger does the 36M use? The 36M uses a 20V DC, 300mA barrel plug charger for the LiPo battery. 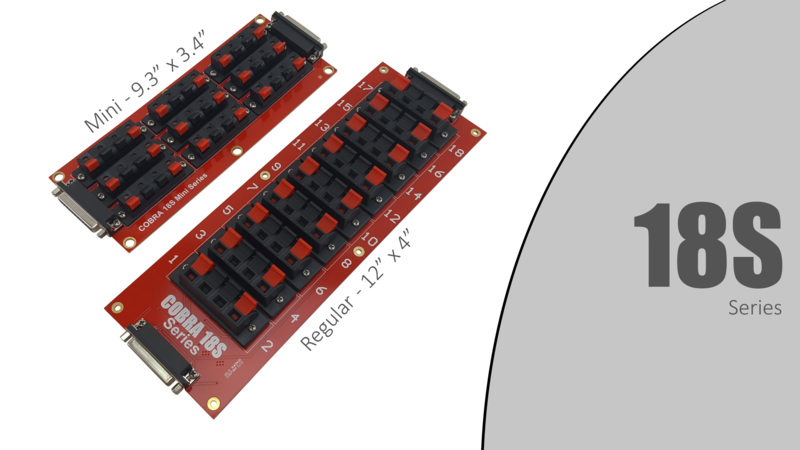 We offer this charger in a single, 5 module, and 10 module configuration. This is the same charger used for the LiPo versions of the 18M, as well as all versions of the 36M and 72M. Can I power the 36M using the charge port? No, the 36M is not designed to be operated while plugged into the LiPo charger. What is the USB port on the 36M used for? At this time, the USB port is used for updating the firmware version. However, this port will support added functionality in the future. What type of screen is used on the 36M? The 36M uses a 128x64 pixel LCD screen. The advantage of this screen is to display the address, channel/bank information, voltage mode, battery levels and signal strength at the same time. This is an improvement over the 18M which displays some of this information during the boot up process, and not persistently to user at all times. I already own 18S Slats, can these be used with the 36M? Yes, all COBRA 18S slats and cables can be used with the 36M. I already own an 18R/18R2 and 18Ms, can they be used with the 36M? Yes, all existing Cobra equipment is compatible with the 36M. However, these units must all be running on firmware version 5.0.2 or higher. If you already own a COBRA system running an older firmware version and would like to use your equipment with the 36M, please see Feature Improvements / Firmware Updates. Can my 18M be upgraded to a 36M? Unfortunately not. 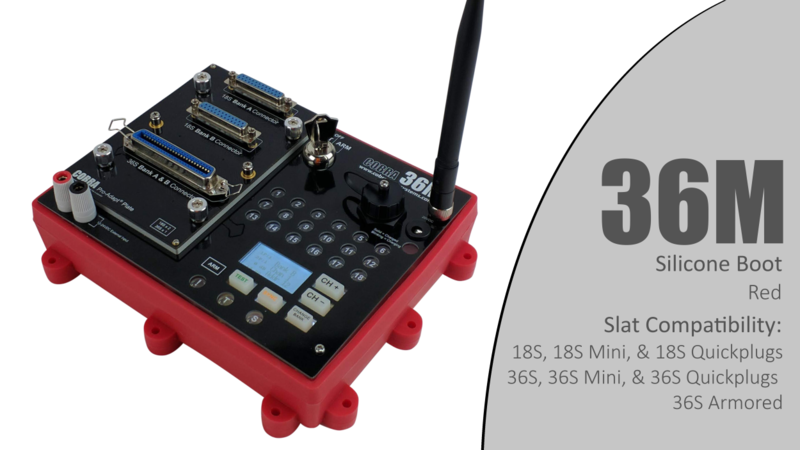 The 36M is a completely new module platform and does not support a hardware update from the 18M. Does the 36M use the same key as an 18M? Yes, the 36M and the 18M use the same key and key switch. Does the 36M use the same antenna as an 18R/18R2 and 18M? Yes, the 36M and the 18M use the same omnidirectional antenna as the 18M. What protective options are available for a 36M? We currently offer protective silicone boots for the 36M. For on-board cues, the 36M is offered standard in a large armored case, which also offers support for 18S Slats. We plan to add more protective options in the future.